Planning an evening over chai and light bites? 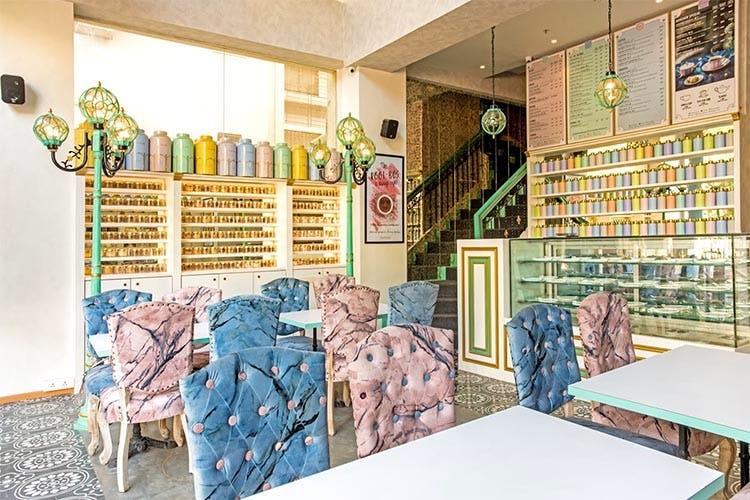 Tasse De Thé has come to this side of town Tasse De Thé has come to this side of town and it’s making signature tea frappes and tea lattes and a visit here is sure to lift your mood any time of the day. Tucked in the by-lanes of Bandra, TDT’s comfy interiors and Parisian-style street lamps make for the ideal spot for all them catch-up sessions. With over 35 fresh brews available throughout the day at such affordable prices, you won’t be able to stop at just one. Pick from a fun collection of tea frappe flavours topped with rich whipped cream – the blender’s pick Matcha & Mint is perfect for a quick detox and energy boost and the nutty Rooibos Blush with elements of rose and vanilla are delightfully caffeine-free. In case you’re watching your diet, the tea lattes with gut-loving flavours such as Mint, Tangy Orange and classic Matcha might just become your favourites. Add some zing to your mood with the Blueberry blended with vanilla and creamy steamed milk or the Spice Rose variant with a mix of Bulgarian Red Rose & Cinnamon – we’re spoilt for choice with all these options! Their fruity iced teas sound perfect to calm ourselves in these sun-drenched days with Passionfruit, Hibiscus, Mint and Blue Pea Flower blends. Satisfy your fancy sweet tooth with their delectable desserts. The Blueberry Lavender Cake with a combo of mellow White Chocolate, Lavender Jelly and Glaze caught our eyes as did the Rich Matcha infused Cheesecake with Mint. Such indulgence, right? Pair your teas with your choice of delicious bites such as the plum sandwich, sriracha cheese sandwich, toasted charcoal bread with chilli-cheese and the good ol’ bagel cream cheese. The good part is that they promise to make these so quick that you’ll be grabbing them to your tables and devouring in no time. #LBBTip: Our TDT folks let us in on an upcoming option to choose our brews with skimmed milk too, we can’t wait to try them here soon. Here’s some more exciting news to celebrate. TDT’s launched a special offer on all tea frappes, tea lattes and desserts priced at just INR 101* till September 30, all day every day! So you know this one’s the place to bookmark for all outings now. Stay tuned to their FB for updates. TDT’s sure to become our new usual (pardon our chai-madness) to escape the city’s usual frenzy. So hit up the phone right away to round up your squad to get the playful times rolling.